서울아트가이드 디에디션을 제공하고 있던 디지털매거진 플랫폼 업체가 12월을 마지막으로 서비스가 종료됩니다. 이번 iOS 11 업데이트에 대응이 되지 않았습니다. 몇개월을 앞두고 갑작스럽게 통보를 받은 상황이라 대안을 마련 중입니다. 혹시 서울에 계시다면 가까운 전시장에서 종이로 발간된 『서울아트가이드』를 가져다 보실 수 있습니다. 가급적이면 익숙하신 형태로 미술전시정보를 제공할 수 있도록 모색중에 있습니다. 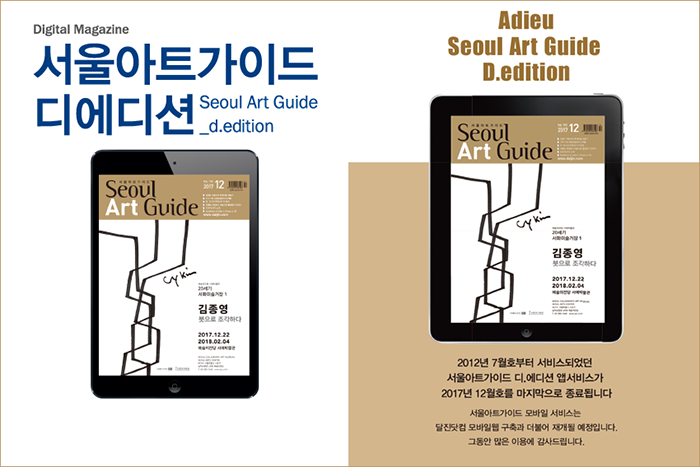 Sadly, we had to terminated Our Seoul Art Guide App Service. Because, Our application partner terminated the web server of application. They thought the digital magazine application has no longer a profit business model. So, we have been searching for alternative options, which one of them is Mobile web. But, we are not decided when it will be opened. 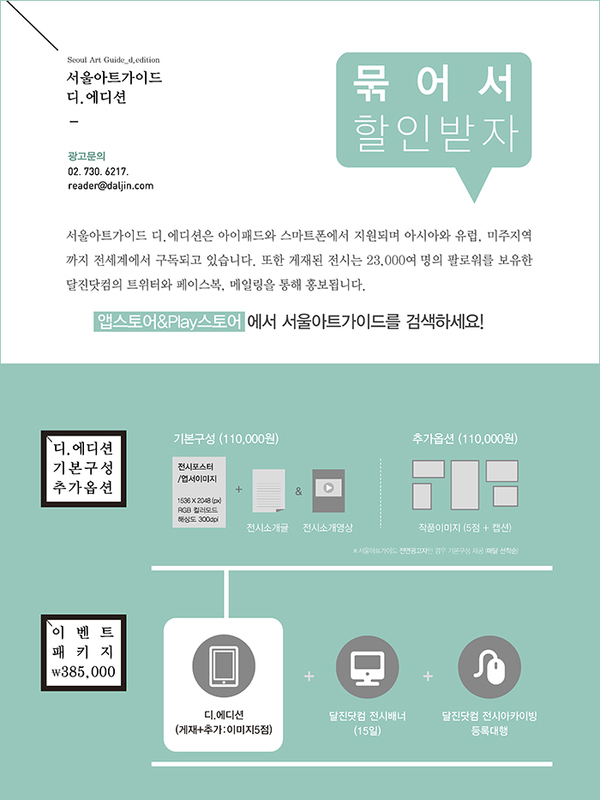 If you want to know the Korean art exhibitions, check up this Link. Apple iPhone 뉴스가판대의 무료App 순위 1위가 되었습니다! 그리고 금주 베스트 App 으로 선정 되었어요! 엔터테인먼트 부분 첫번째 추천 앱이 되었습니다! 뉴스가판대 무료 iPad App 순위로는 15위 였습니다. Click ▶ [FAQ] 서울아트가이드 디.에디션 어떻게 설치해요?